WHO GETS A DUST MITE ALLERGY? 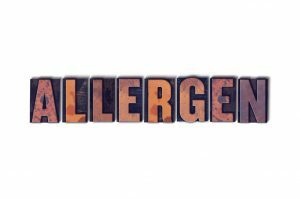 There are many allergens present both inside structures and the outside environment. These allergens can be something as natural as pollen or as manmade as latex. The intent of this article is to shed some light on a tiny arachnid which lives in virtually any home. 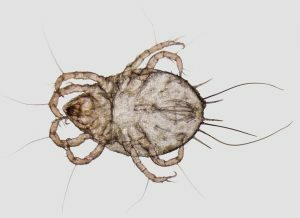 Commonly known as a dust mite, it lives and thrives where we sleep and watch TV. Ever present though invisible to the naked eye, this mite sheds it’s skin as it grows. These skin sheds are known allergens and can pose a serious problem to those who have an allergy to these sheds. Along with their feces, dust mites are second only to plant pollen as the most common allergen to man. Our company is a supplier and distributor of chemicals and equipment. Though most of what we sell are related to more traditional pests like ants and roaches, dust mites are a very real problem needing both know how and the right products to solve problem infestations. By minimizing dust mite populations within the home, those who reside there who are allergic to dust mites can live much more comfortably. In general, the products and procedures outlined below apply to dust mite problems and will control a local problem. But you may find our online information about OAK ITCH MITES, SCABIES, LICE and ITCH MITES helpful. Dust mites can be found in any home around the world. They are closely related to spiders and ticks and are similar in look to spider mites or chiggers. However, dust mites are small. So small are dust mites that they cannot be seen with the naked eye. Dust mites live their lives on objects like couches, chairs, bedding, mattresses, stuffed toys and clothing. They need high humidity to survive – generally in excess of 60% – and a lot of food. 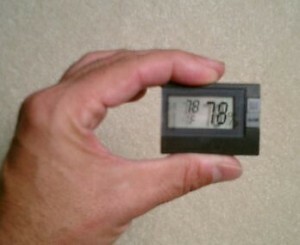 If you are unsure of local humidity levels, get one of our HUMIDITY MONITORS. It will keep track of both temperatures and humidity keeping records of lows and highs over time. This is very helpful when needing to identify problem locations in the home. Dust mites live on dander which is primarily the shed skin from people and pets. Furniture and beds are key places where dander accumulates and it is in these areas where dust mites prosper. It is not uncommon for a pillow to add over 10% of it’s weight in just 2 years due to live dust mites and their sheds!!! Furthermore, populations can exceed 10 million dust mites on any one mattress in less then 3 years! Though small as an individual, the accumulative impact the sheds of dust mites can have is well documented. To help monitor local humidity in any room, install a monitor. These are quite small and discreet. But if they reveal high moisture levels, take action to reduce the amount of water in the room which will slow the natural develop of most any pest including dust mites. Pretty much anyone. Allergies and allergic reactions to dust mites do vary from person to person. Clearly, some people are not affected by their presence; for others dust mites pose a very real problem. Though its believed an acute exposure to dust mites at a young age can have a life long impact, many adults can be suddenly affected and found to have an adverse reaction to their presence. Reactions include but are not limited to sneezing, itching, watery eyes, wheezing, headaches, fatigue and depression. Though not common, some people may develop a red rash. Most important is the fact that dust mites are impacting over 50% of asthmatics. These are people who need pure and allergen free air to breath. The fact that dust mites and the stuff on which they feed can easily get air borne makes them so much more of a threat to anyone that suffers from respiratory disorders. Dust mites live a relatively short life. They will immediately begin feeding once they hatch. During the next month they will molt at least twice. Their skin sheds are a major allergen if not the most important. Clearly their feces are important as well since feces and skin sheds can accumulate over time. In their feces lies a very potent digestive juice which is thought to be another contributor or known allergen. Once adulthood is reached, female dust mites will lay 50-100 eggs over a 1-2 month life cycle. 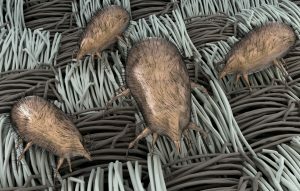 Dust mites will migrate throughout the home taking advantage of furniture, pet bedding, carpeting, blankets and mattresses. They do this by hitching a ride on ones clothing which is another prime living location. Remember, dust mites need dander – basically human and pet skin – to live. This dander is most commonly found on furniture, carpeting and bedding but due to it’s light weight, dander will float around to most any part of the home. In fact, over 75% of the “dust” one sees in a sunbeam shining through any window is dander. People shed over 1/5 of an ounce of dander WEEKLY so there is an ever replenished supply of the very food dust mites need to live. For this reason it is conceivable that most any room could harbor populations. However, only the rooms with ideal humidity and heat will allow for rapid and advanced populations. Like most any insect or animal, there are a lot of unfounded fears and misunderstandings about dust mites. Knowing what is and is not important when dealing with them inside the home will better enable you to address the key issues when you want to reduce their populations. 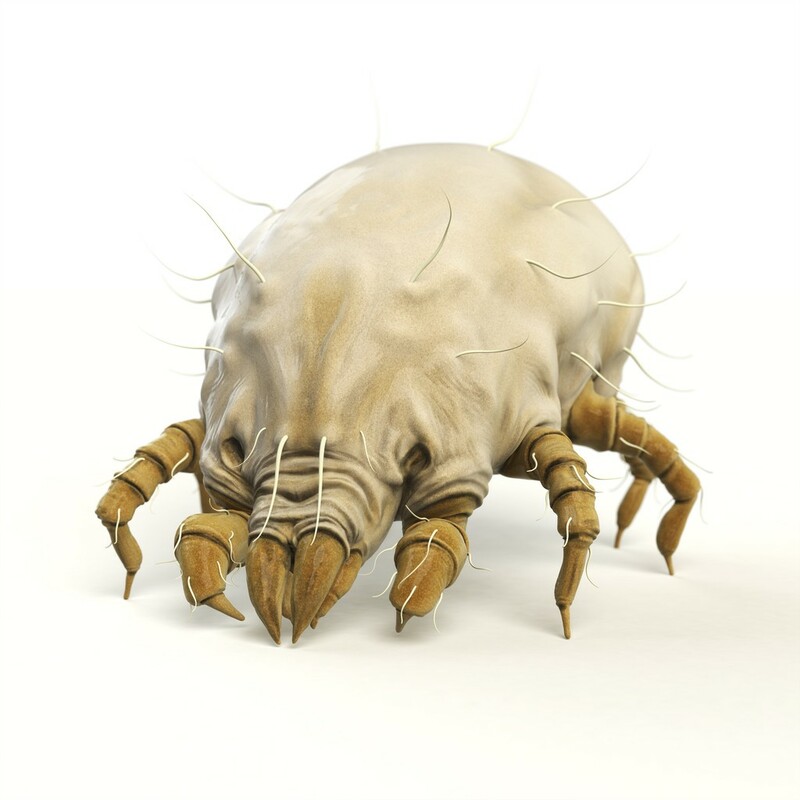 FALSE: DUST MITES THRIVE IN AIR DUCTS. Generally speaking, dust mites do not like the temperature, humidity or lack of food which is pretty much a constant in any normal and healthy air duct system. Don’t waste your time getting them cleaned out if your intention is to get rid of dust mites. The only viable reason for cleaning air ducts is to remove mold, mildew and other problematic fungus growth or spores which could certainly pose a problem. Just don’t do it for controlling dust mites as this won’t help. Spend your time and money by focusing on your living area. This will have the most profound positive impact and in most cases, solve dust mite problems. FALSE: DUST MITES CAN BE VACUUMED OUT OF THE HOME. Again, not true. A good vacuum can reduce dust, dander, dust mite sheds, dust mite feces and other known allergens which will help people sensitive to such matter. However, dust mites are generally not out in the open. Remember, they thrive in mattresses, furniture, carpeting and other locations where vacuums will have little impact. Trying to reduce dust mite allergens by vacuuming is probably a waste of time. However, keep vacuuming! But do it for the purpose of keeping the structure clean and helping to reduce that which the mites need – dander. And if you really want to have a big impact, use a vacuum which has a liquid filtration system. Such designs are much better at filtering out the known allergens compared to typical paper filters. FALSE: SPECIAL AIR FILTERS WILL REMOVE ALL DUST MITES. Again, not true. Though HEPA filters will remove many types of allergens, they will not address the most important part of dust mite management: dealing with them at their source. Filters are definitely an asset and should be installed in homes where individuals can benefit from the extra filtration. But install them for just that reason, not for removing dust mites. It’s not going to happen. FALSE: SPRAYING FOR DUST MITES IS A WASTE OF TIME. Again, not true. It is easy to kill a dust mite and the few products which are labeled for dust mite control do a good job. However, as explained earlier, the real problem is the skin sheds and feces of the dust mite. If in fact there is a dust mite problem in the home, it will take more then just spraying for them to get the desired results. However, killing off as many dust mites as possible will certainly help the problem and is part of any well integrated dust mite control plan. There are several things which can be done to help minimize the impact dust mites. Reducing and minimizing conditions conducive to dust mites will help create an environment which is more comfortable and healthier for everyone. Furthermore, the products and devices used for dust mite and dust mite allergen removal will work on many other pests and allergens too. This means your efforts will be impacting several variables any one of which could be just as much if not more important then the dust mite itself. First, do you have a significant dust mite problem? Probably. And in the past it used to be common to test for them all the time. Today these tests are still fairly costly and for the most part, not needed. Why? Because most any home will have some level of dust mite activity. 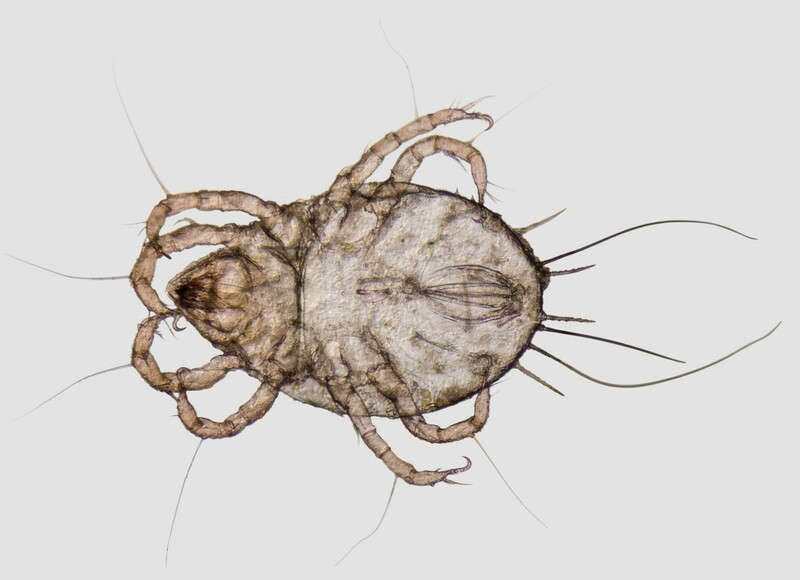 So if you suspect you have dust mites or some other kind of mite active, treating is probably the way to proceed without having to test? But if you must know, get a DUST MITE TEST KIT. Each kit includes a testing vial, distilled water, a measuring dust spoon and reactive strip. Though the most common areas you’ll want to test will include beds, pet bedding, furniture, couches, chairs, curtains and carpets, don’t overlook counter tops or other “high” locations. Missing just one location can prove to be a big problem. Each kit is large enough for you to treat the average 3,000 sq/ft home and along the way, identify key problem areas. Treating for dust mites can be done effectively with three forms of spray. The aerosol is good for small apartments and spot treatments where you can’t spray a liquid. But if your home is 3,000 sq/ft or larger, use a liquid. We have a “ready to spray” and a concentrate. The concentrate is the most cost effective option for large jobs but they all will work when done properly. The first is an aerosol. BEDLAM aerosol is an odorless, easy to use “hair spray” type product. Safe enough to be applied over comforters, pillows, mattresses and bedding, it will quickly kill dust mites (and many other pests too like bed bugs). Bedlam can be applied over carpets, furniture and even up high where cats might travel but are hard to spray with a liquid. One can will be enough to treat up to 1500 sq/ft of surface area and should be applied twice spaced out two weeks apart to control the problem. After the initial, plan on treating every 3 months so they don’t come back. For large homes or if you have a lot of thick carpeting to spray, you’ll be better served using a liquid. We have two options which work well for dust mites. The first is STERIFAB. Sterifab is safe enough to be applied anywhere including bedding, furniture and carpets. It uses an alcohol base so its fast acting and fast drying. Treatments will kill dust mites on contact and you can vacuum afterward to remove carcasses and exoskeleton. 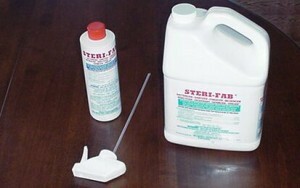 Sterifab is ready to spray so no mixing is needed. And the pint comes with a handy trigger sprayer so its small and compact. The pint can cover up to 125 sq/ft. The gallon will cover up to 1,000 sq/ft but you will need a TRIGGER SPRAYER or PUMP SPRAYER (both listed below) if you get a gallon jug. 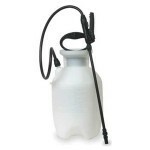 A good PUMP SPRAYER will help for large scale treating though the optional trigger sprayers work fine. Just remember with the trigger sprayers, you have to squeeze pump every spray but with the pump sprayer, you just release the spray using the wand and valve once the tank is pressurized. If you need something more concentrated, ONSLAUGHT is an odorless concentrate commonly used in the home for a range of mites. Add .5 oz per gallon of water and spray the mixed product over 1,000 sq/ft of carpet and furniture. This product should not be applied to bedding or pillows; use the BEDLAM listed above for these sensitive areas. And since Onslaught is mixed with water, it won’t be convenient to use over anything you don’t want “wet”. For these areas, plan on using the Bedlam too. Onslaught should be applied twice in the first month of beginning a treatment program. After that, treat the home every 2-3 months to keep dust mites under control. Lastly, don’t forget to change out bed linens and wash them weekly. Dust mites love sheets, pillow cases, towels, and just about any natural fabric. They will target such fabric – especially when it contains dander – and live amongst the fibers. The most common way dust mites migrate in the home is by hitching a ride on our clothing. Furthermore, curtains and drapery tend to attract and hold dander flakes quite well. Dust mites will readily thrive on them so they need to be washed on a regular basis. When washing fabric or clothing which harbor dust mites, be sure to use ALLERGEN DUST MITE DETERGENT. Like the other allergen denaturing products, this detergent works by ionizing contaminants which enables them to release from the fabric. 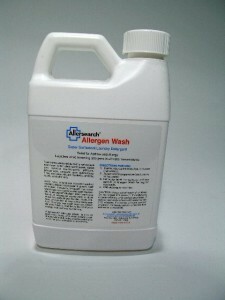 Allergens are then washed away in any water temperature which really helps to minimize exposures. Add 2 capfulls per load of wash. Each jug will treat 25-30 loads. In summary, dust mites pose a very real and impacting pest in the home. Their skin sheds and feces are strong allergens which can impact children and adults. In fact, many pets are allergic to these very same allergens. 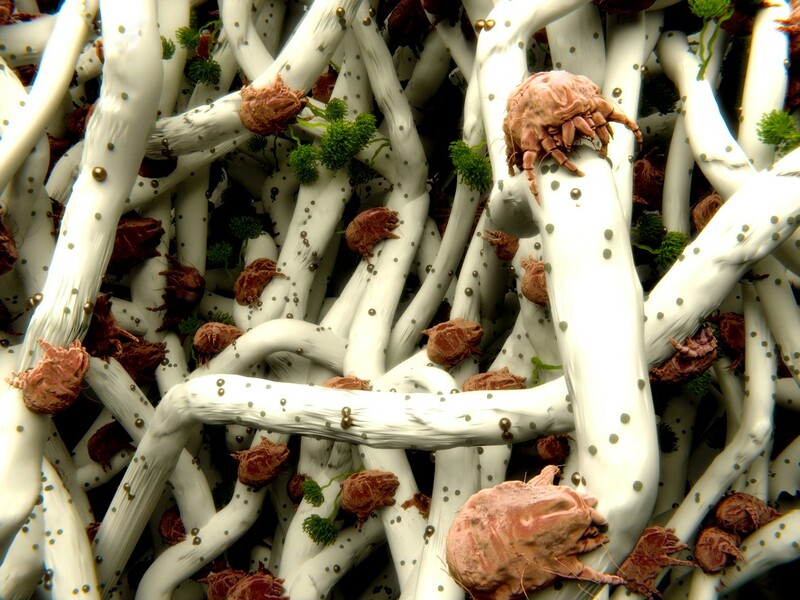 To reduce the impact dust mites will have to the occupants of any structure, follow our guidelines for both dust mite and dust mite allergen reduction. I have 3 dogs that are all very itchy all the time…I have hundreds of dollars in vet bills and medicine for allergies that don’t seem to be working….I now have developed a small red itchy rash on my back. The dogs have been checked multiple times for fleas. Not one flea. Could this be carpet mites dust mites? I have read all of the above information and I am overwhelmed at the possible infestion of mites in my home. Does Steam cleaning the carpet work? And is the spray listed above safe for pets in the house ? Can I put that spay on furniture ? First and foremost, all the sprays listed above are pet and people safe. Second, you may want to try some of the Oxy Med Anti Itch Pet Spray for your pets. We have found this product works wonders on both insect bites and skin allergies that cause pets to scratch. Keep in mind pets can develop dry skin during winter months or if its dry where you keep them. Oxy Med will reduce the itch associated with any such condition and in doing so, cut down on how much they scratch big time. Next, get some Sterifab and treat all carpeting, rugs and bedding which might be harboring mites or some other crawling insect like fleas. Lastly, install 3-4 Aerosol Machines fitted with some Metered Insecticide. These machines are the best way to control flying pest problems. Now I know you didn’t mention flying pests but the symptoms you’re describing could very well be caused by noseeums, biting flies, gnats, thrips or mosquitoes. Installing a few aerosol machines will take care of all these pests as well as most any species of crawling pests like itch mites.